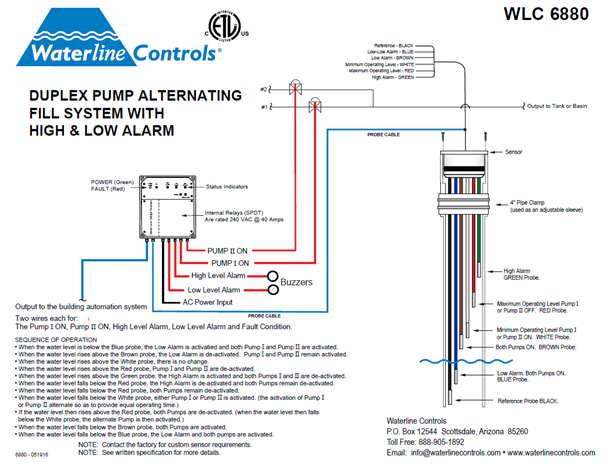 The WLC-6880 is used to alternate between two well pumps or supply pumps keeping a vessel filled to a desirable level. If for any reason a single pump cannot keep up with the fill rate needed, then the water in the tank will fall below the second trigger level, triggering the second pump. Both pumps will now operate until the tank has recovered completely. The High and Low alarms can be set to have audible alarms and/or visual alarms. This system has the capability of sending all the set point and activations data to the BAS using dry contacts closures as the signal trigger. Turn on an LED to indicate thes sensor has tripped. The Control Panel has visual displays indicating power to the level control panel, when the control panel is actively filling and the low and high water alarms. The Fill dry contacts can be used as a comparative to develop a baseline benchmark of water usage for the system.